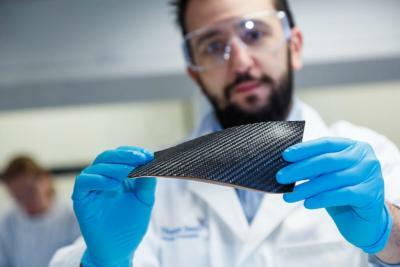 Chemicals manufacturer Thomas Swan has announced an expansion of its range of formulated Elicarb Graphene materials with a prototype product focusing on the manufacture of a carbon fiber composite prototype. Initial independent testing with unidirectional carbon fibers reportedly gave very encouraging results. Adding 1% wt Elicarb Materials Grade Graphene in the epoxy resin in the manufacturing of a carbon fiber laminate improved flexural strength and modulus. This gave the company motivation to move the development one step further and manufacture a commercially relevant carbon fiber prepreg (a woven cloth of carbon fibre pre-impregnated with resin). This prototype was prepared by working collaboratively with an established and experienced third party.